Formula One: Rosberg holds off Hamilton to keep title hopes alive! Home » Formula One: Rosberg holds off Hamilton to keep title hopes alive! 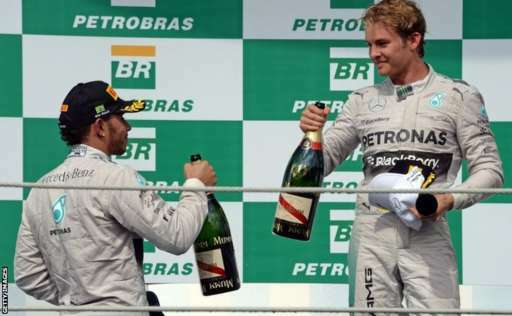 Nico Rosberg has won the 2014 Brazilian Grand Prix after a tense race with team-mate and title rival Lewis Hamilton. Lewis had been right with his team-mate before spinning at the mid-point of the race. He then cut down a 7 second gap to get back on the gearbox of Rosberg but was unable to get past and had to settle for second place. 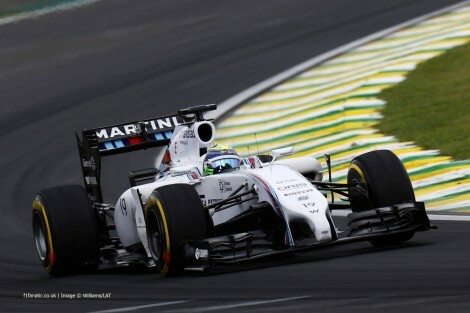 Brazil’s Felipe Massa managed to claim the final spot on the podium despite having gotten a penalty for speeding in the pit-lane. The rain continued to hold off against prior expectations earlier this week. Rain had meant to have fallen on every day of running, but that was not the case. Instead, 50 degree track temperatures and an expected high degradation, 3 stop race lay ahead of the drivers in the penultimate Grand Prix of the season at the Autódromo José Carlos Pace. The driver who started the race on pole position failed to win the last 3 Brazilian Grand Prix, but that didn’t stop Nico Rosberg getting a great start to hold the lead into the Senna S. Lewis Hamilton made a decent getaway as well to slot into 2nd. 8 tenths of a second separated them by the end of the first lap, with no drivers coming to grief like they had done in Austin a week ago. Sebastian Vettel had a shocking start as he lost two places to Alonso and Magnussen at turn 4. Due to the blistering temperatures, the short life of the soft compound tyres and the high tyre degradation of the Brazil circuit, the first pit-stop phase began very early on laps 5 and 6 out of 71. Pastor Maldonado was the first to pit, followed by the first front-runner of Felipe Massa the lap after. Bottas and Button pitted the lap after and rejoined behind Massa, with race-leader Rosberg pitting another lap later. Bad luck would plague Felipe Massa for the second year in a row as he would receive a 5 second penalty to be added to his next stop for speeding in the pits. Lewis Hamilton pitted a lap after his team-mate and rejoined just behind his team-mate after a marginally better stop. A number of drivers lower down the order tried to attempt a 2 stop strategy instead of a 3 stop. Amongst those drivers were Nico Hulkenberg and Daniil Kvyat, who now led the race after not pitting in the first 10 laps. The two Mercedes cars made short work of the Force India and the Toro Rosso to retake the top 2 positions, with the pair pitting on lap 18. During the second stint of the race, tyre degradation reached it’s peak. A majority of the drivers ended up developing blisters on their tyres. Hamilton, despite the tyre degradation, threw caution to the wind as he sought to close the gap to his team-mate in 1st. By lap 24, Hamilton had the fastest lap of the race by half a second and was almost in the DRS zone of Rosberg. Nico pitted on lap 26 for new tyres along with Massa, who served his 5 second penalty. Valtteri Bottas followed him in soon after but had a nightmare stop as the team appeared to be re-tightening his seatbelts. This allowed Massa back past. Drama was going on for the lead of the race as well. 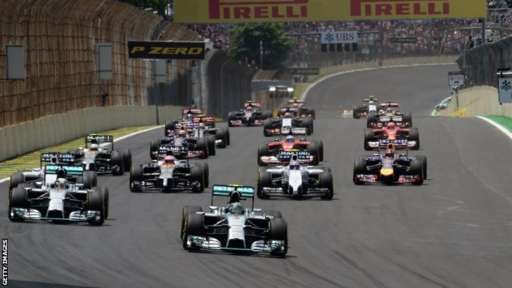 Lewis Hamilton was told to push on the lap after Rosberg’s stop and he duly delivered by setting the fastest lap of the race. The team then kept him out one more lap, but it was too much for Lewis’ tyres to take. He lost the rear of the car into turn 4 and half spun off the track. He stopped at the end of the lap and emerged over 7 seconds behind after what could’ve been the race lead for him! The next 23 laps saw Hamilton take chunk after chunk out of Rosberg’s lead. After 1 lap, Hamilton had taken 1.3 out of his lead and then didn’t relent. Tenth after tenth, half a second after half a second. By lap 53, 23 laps after he returned to the track, Hamilton was in Rosberg’s DRS zone after the pair had made their final stops. They had been over a second apart when Rosberg pitted, but once again Hamilton made up time on his in-lap to come out right on his gearbox. During the time, the 2 stopping drivers made their final pit stops. This included Raikkonen who pitted on lap 35. The stop was going well until the front jack failed, dropping the car in the middle of tyre change. This cost Raikkonen 7 seconds as he went down into 13th place. Kvyat and Hulkenberg also pitted, with the latter returning to the track to battle Bottas, who was in the lower reaches of the points after his poor stop earlier on. Hulkenberg lunged up the inside into turn 1, but then locked up and went wide. Bottas was then forced to take to the escape road which allowed Raikkonen to capitalise to pass up the inside of turn 5. Felipe Massa and Jenson Button both pitted for their last stops together. They had been battling over 3rd and 4th for most of the race. Massa’s day continued to go in a slightly less straightforward way than he would have hoped for as he pulled into Button’s pit-box before realising his mistake and heading to his own. The pair soon got by the two stopping drivers who were starting to fall back as their tyre life decreased. The final stint of the race saw the two Mercedes drivers trade best laps. Rosberg took the fastest lap, then Hamilton took the fastest lap back. Hamilton seemed faster in sector 1 and sector 2 with the aid of DRS, but Rosberg was keeping the gap stable at 0.7 seconds thanks to a better 2nd sector. In the end, despite seemingly being the quicker driver, Hamilton could not pass his team-mate and would have to settle for second. 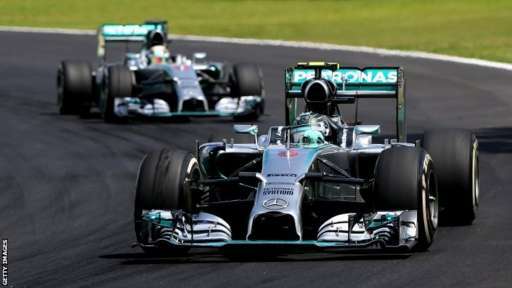 Nico Rosberg crossed the line just over a second ahead of Lewis Hamilton to take his 6th win of the season. With Lewis Hamilton finishing 2nd, the gap between the two heading into the final round is 17 points, meaning that Hamilton needs to finish 2nd in the double points finale in Abu Dhabi to guarantee himself the championship if Rosberg wins. Felipe Massa, despite serving a 5 second penalty and trying to stop in the McLaren pit, finished in 3rd place. Remarkably this is only his 2nd podium of the year as opposed to team-mate Bottas who has had 5 podiums; highlighting the bad luck that has his Massa this season. Jenson Button fought his way back into 4th place during the last stint to add another strong finish to his end of season campaign. The McLaren driver is fighting for his space on the grid next year and this result could help him to keep it. Sebastian Vettel took 5th place after following Button through on Kimi Raikkonen. Raikkonen was the highest placed 2 stopping driver as he took 7th place. He fought tooth and nail with team-mate Fernando Alonso to try and keep 6th place after not being instructed by Ferrari to let the much faster Spaniard through; possibly indicating Alonso’s almost certain departure from the team for next year. Fellow two stopped Nico Hulkenberg finished behind Raikkonen in 8th place. Kevin Magnussen and Valtteri Bottas completed the points paying positions, with Bottas having a race to forget in the Martini Williams. Daniil Kvyat finished just outside of the points for Toro Rosso, with Pastor Maldonado unable to replicate his points finish in 12th place. Vergne and Gutierrez, who are currently on the look-out for race seats next season, finished in 13th and 14th, with Perez and Sutil the final two finishers. Only 2 drivers failed to finish the race. Romain Grosjean retired in the final 10 laps in his Lotus; his 7th retirement of the year. Daniel Ricciardo joined him after suffering a suspension failure. The Australian had scored points in every race since the Chinese Grand Prix and had completed the most laps of anybody this season. Retirements: Romain Grosjean, Daniel Ricciardo. There is now a 2 week break before the drivers reconvene in Abu Dhabi for the final race of the season. With double points on offer a number of battles will be decided, chief among which being the fight for the drivers’ championship. Will Lewis Hamilton take his 2nd world championship, or will Nico Rosberg emulate his father Keke to take the championship trophy for the first time? You’ll have to wait a fortnight to find out!